The city of Ujjain, located on the banks of the Kshipra River in present day Madhya Pradesh, has been an important centre for Hindu religious and cultural activities from the ancient times. The city has continued to thrive and prosper down the centuries and is now a bustling township in the central heartland of India. The earliest settlements in Ujjain date back to 700 BC as per the excavated findings in the area. In ancient India, the kingdom was called Avanti with its capital at Ujjain. The city was also known as Avantika or Ujjaini. By 600 BC Avanti was one of the sixteen Mahajanapadas (kingdoms) of Aryavarta (north India), the references of which we find in many ancient texts like the Puranas. Ujjain as the capital and a prominent city on the Malwa plateau, remained as an important political, commercial and cultural centre. The people of Ujjain celebrated Lord Shiva as their guiding deity and devotedly worshipped him. Mythology has it that Lord Shiva impressed with the devotion of the people, granted their wish and resided in the city in his form of ‘Mahakaleshwar’ – the fiery column of light which signified the unending passage of time. A large and ornate temple was built in 600 BC to worship Lord Shiva in the Mahakaleshwar form in Ujjain, which is one of the holiest and most visited Shiva temples in India. The temple stands till date and is held as a place of pilgrimage by devout Hindus. Ujjain flourished greatly during the Maurayan period. Ashoka was first the viceroy of Avanti when his father Bindusara ruled the empire and later when he became the Emperor, he glorified Ujjain to a large extent. After the Mauryans, Ujjain was ruled over by local rulers like the Shungas and the Satvahanas until the Gupta period of history. During the rapid conquest of northern India by the Delhi Sultanate kings, Ujjain was attacked by Sultan Iltutmish in 1234. The city was pillaged and plundered and the centuries-old Mahakaleshwar Shiva temple was severely damaged. This attack on the city was a huge setback from which the city could only recover much later. For the ensuing centuries as the country passed through the Muslim rule from Delhi Sultanate till the Mughals, Ujjain remained a low profile centre. However it was still venerated as an important pilgrimage place by the Hindus who flocked there. By the early 18th century when the Mughal power in Delhi was waning and most of the kingdoms in India had asserted their independence, Ujjain came to be ruled over by the Maratha Scindia dynasty. However, the Scindias soon shifted their base to Gwalior from where they continued to rule. In 1736, the Maratha general Ranoji Scindia rebuilt the Mahakaleshwar Shiva temple (to its present structure) in Ujjain and restored its earlier reverence and architectural grandeur to a great extent. The Scindias and the Holkars of the region continuously fought for the suzerainty of Ujjain until both were subdued by the advancing British armies. As Ujjain and the region passed under the British Raj, they decided to reduce the importance of Ujjain and promote Indore as the alternate power centre for the region. This had also to do with the merchants of Ujjain refusing to support the British policies, and their direct revolt towards the British motives. After Independence, Ujjain continued to be part of Madhya Bharat region until 1956 when it was infused into the state of Madhya Pradesh. Ujjain is considered to be one of the seven holy cities for the Hindus (Sapt-puri) and a major pilgrimage centre. It is also the venue of the Kumbh-mela - the religious fair which occurs once every 12 years on the banks of the Kshipra River, the last one being held in 2016. Ujjain recently has also been selected under the ‘Smart City Development Programme’ by the Government of India. 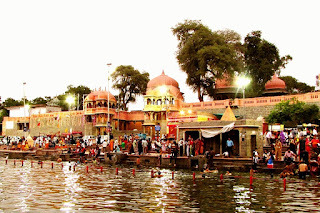 Photo: Ram Ghat on the Kshipra River in Ujjain. I am participating in the #BlogchatterA2Z challenge and today’s letter is ‘U’. There was absolutely no other option for U other than the ancient city of ujjain, right? I've read extensively about the Mauryas and especially Asoka and have some knowledge about Ujjain. It will be great if you can expand the details of the years under the sultanate. Another solid entry here, Sayan. Thanks Varad ! Glad that you liked it... Yes, Ujjain was a straightforward choice for U and anybody's guess ! I did have the choice to write about Udabhandapura or Uchh, but leaving out Ujjain as an ancient city would have been a sacrilege ! Noted your point about the years under the Delhi sultanate.. I guess more research and time needed to explore those times of Ujjain...noted. Kumbh Mela is what makes Ujjain still a sought after destination. But I wasn't aware of such a rich historical background. Your posts really make history an interesting subject. Thanks Sonia for your ever inspiring comments. I am happy that history is coming alive in my posts.. that's the endeavour ! Wow, a very ancient city. Thank you Liz for reading my post and commenting! Hi Sayan, after a long break finally I read your post. Enjoyed it as always. Ujjain is very close to me as my name has its origin there only. Kshipra was actually shipra in ancient time which means fast moving.But with time, it became Kshipra.